Whereas the Drysdale Clifton Springs Curlewis Association (DCSCA) is totally in favour of the construction of the bypass, DCSCA urges the minister to refuse the amendment with respect to option 3a - the signalized Western Intersection - on the grounds of the 21 concerns listed below. Also to request that VicRoads further investigate option 11 in order to provide the community with the undisputed traffic efficiency and safety and environmental benefits of this roundabout option. DCSCA is very concerned that the blocking off of Jetty Road creates an unsafe, inefficient, ugly and unnecessary traffic bottleneck. With option 11 the traffic delay is only 7sec. Number of vehicle-to-vehicle conflict points passed through = 26. Of these 19 are crossing or T Bone conflicts where, should a collision occur; the risk of Fatal or Serious Injury (FSI) is 80% approx. With option 11, vehicles pass through a total of only 8 low speed merge/diverge conflict points all of which have a risk of FSI of 5% or less. Number of vehicle-to-pedestrian conflict points passed through = 4. All of which have an FSI risk of 80% approx. With option 11, vehicles pass through one vehicle-to-pedestrian conflict point with an FSI risk of 50% approx. On Road Cyclists. Number of cyclist-to-vehicle conflict points passed through = 26. All of these have an FSI risk of Fatal or Serious Injury (FSI) of 90% approx. With option 11, cyclist pass through a total of 8 merge/diverge conflict points all of which have a risk of FSI of 80% approx. This table illustrates the difference in safety and traffic efficiency for Clifton Springs residents. With option 3a a vehicle travelling from Jetty Road to the Geelong Road will pass through 19 dangerous veh-to-veh conflict points and 4 dangerous veh-to-pedestrian conflict points and be subject to a delay of 74 seconds. With option 11 there are zero veh-to-veh conflict points likely to result in injury, one veh-to-pedestrian conflict point and VicRoads Consolidated Options Report predicts a delay of only 7 seconds. Zero dangerous conflict points above 6% probability. 1 conflict point Probability = 50% approx. For more information see Jurewicz C, Sobhani A, Development of an analytical method for Safe System assessment on intersection design. 27th ARRB Conference 2016, DCSCA Presentation No 2e.doc and BypassDCSCA.No2.doc. 1. The risk of Fatal or Serious Injury (FSI) vehicle-to-vehicle crashes will be increased approximately twenty fold. 2. The risk of FSI vehicle-to-cyclist crashes will be increased approximately two fold. 3. The risk of FSI vehicle-to-pedestrian crashes will be increased approximately two fold. 4. The response time of the Bellarine State Emergency Services Unit will be significantly increased. 5. Option 3a creates a traffic bottleneck that VicRoads data shows is a massive 10 times less traffic efficient than option 11 for Clifton Springs Drysdale traffic and a massive 5 times less traffic efficient overall. 6. It will result in increased travel times between Drysdale Clifton Springs and Geelong, which will have detrimental effect on the local economy. 7. It does not comply with Victoria’s Towards Zero Safe Roads System. It does not support a sustainable Victoria as it is wasteful of fuel. It does not contribute to social wellbeing as it detrimentally effects the local environment, will discourage tourism and creates unnecessary air pollution. It will have a detrimental effect on the local economic prosperity. It does not improve safety. 9. It does not comply with any of the 4 Project Objectives as set out by VicRoads. It does not reduce travel times and improve the transport network for Drysdale Clifton Springs residents. It does not improve safety for motorists, pedestrians or cyclists. It does not improve the attractiveness of High Street at the important entrance to the township. It does not improve accessibility and connectivity to Drysdale for the community and tourists alike. 10. It has a significantly higher cost of construction. 11. It does not fit within the current Public Acquisition Overlay (POA). 12. It requires the purchase of in excess of 2 Ha of land (several items compulsory, resulting is stress to these local residents and the subject of adverse submissions) at the entrance to Drysdale that is currently zoned Rural Living Zone. 13. The pleasant ambience of Lake Lorne Reserve and the entrance to Drysdale will be spoilt. 14. There will be significant loss of established trees. 15. There will be significant detrimental impact on High Street residences and businesses. 16. There will be in excess of $1,000,000 per year cost impost on the community due to the fuel usage whilst waiting at traffic lights. 17. There will be increased pollution and carbon emissions with associated health risks. 18. It will have higher ongoing maintenance/operating costs. 19. It is inconsistent with the roundabout treatment for all other intersections on the Drysdale Bypass. 20. 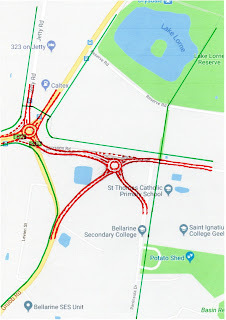 It is contrary to community consultation conducted by VicRoads in 2015, which, of the treatments proposed, clearly showed a roundabout to be the first preference and traffic signals to be the least preferred. 21. And finally it will be politically unpopular - in that so much money will have been spent to make the traffic conditions and ambience at the entrance to the Drysdale Clifton Springs community so much worse. Note 1. Option 11 does not have any of these concerns. Note 2. DCSCA has raised these concerns with VicRoads, but, as can be seen from VicRoads Response to questions from DCSCA, VicRoads has provided no evidence to counter any of these concerns and, in many cases, does not dispute the validity of the concerns. DCSCA is at a loss to understand how VicRoads could assert “quote” - “After considering all aspects of the Safe System Assessment, engineering investigation and review has concluded that traffic signals are the best treatment for the GrubbRd/High Street intersection” when all evidence available to DCSCA clearly shows that option 11 is a much simpler solution and is far superior in every respect. DCSCA can only assume that VicRoads has not correctly assessed the option 11 proposal. This proposal is for a twin roundabout system (designed to Austroads recommendations) within an active transport network (pedestrian/cycle paths). This is a simple improvement of the existing situation where Andersons Road becomes the bypass. The current roundabout is enlarged to two lanes, which overcomes the congestion during peak periods. The Grubb Rd/Andersons Rd and Peninsula Dr/Andersons Rd intersections are replaced by a 2-lane roundabout. 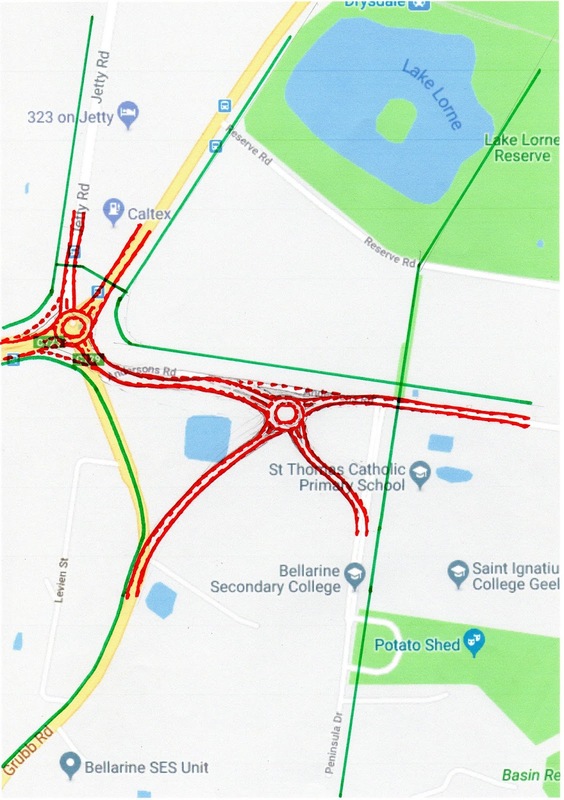 Slip lanes are provided so that Geelong/Bypass traffic only has to pass through one of the roundabouts and a slip lane is provided for Geelong to Jetty Road traffic. VicRoads does not disputed that its own data shows this option is a massive five times more efficient than option 3a. Safe pedestrian crossings are provided across Jetty Rd and High St close to the existing bus stops as shown, an appropriate distance away from the roundabout. The unused section of Grubb Road could become part of the active transport system. Note. It would be DCSCA’s recommendation that cyclists (especially students and recreational) be encouraged to use the active transport network rather than the road network. It should be noted that VicRoads did a lot of good work on option 11 but designed it with pedestrian underpasses under Jetty Rd and High St and with a Jetty Road roundabout of a massive 111metre overall diameter. This is 64% larger than Austroads recommendations and, unsurprisingly, this design had packaging problems. Note. The current roundabout has an overall diameter of 43m approx. Whilst underpasses would be the optimum solution for the Jetty Rd and High St crossings, DCSCA would concur that pedestrian and off-road cyclist volumes would be probably insufficient for their justification. DCSCA recommends that the crossings be pedestrian controlled signalized platform crossings similar to the image shown below. These two crossings would have a total of 8 vehicle-to-pedestrian conflict points where pedestrians cross only one stream of traffic at a time and at which the platform treatment would reduce vehicles speeds to little more than 40 kph. With option 3a there are approximately 50 vehicle-to-pedestrian conflict points where pedestrians have to cross streams of traffic that are potentially coming from 3 different directions and where vehicle speeds of 60 kph are allowed. DCSCA considers that it is obvious that option 11 will be much safer for pedestrians than option 3a and the installation of motion sensors would further improve safety and minimize the waiting period for traffic. 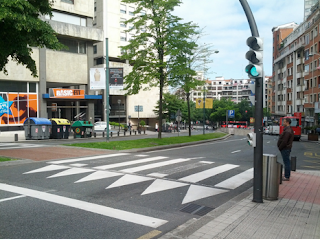 An image of the type of pedestrian controlled signalized intersection proposed by DCSCA is shown. DCSCA can see no reasons (engineering or otherwise) why crossings such as this cannot be constructed across High Street and Jetty Road close to the existing bus stops. This would provide good connectivity between the Jetty Road Growth Area and to the pedestrian underpass to the education and sporting precincts, and to the bike path that is to be constructed alongside the bypass. The roundabout system is clearly the better option. Please do not ruin this intersection with yet another set of inefficient traffic lights. Take note of the evidence and do what is right for the Bellarine peninsula. After all the ado/criticism (above) of VicRoads decision that lights were the best option, surely a reporting of the meeting outcome is warranted. The 11 April, 2018, meeting requested by the local community association and held by Vicroads, at the Potato Shed in Drysdale, presented modelling and explanation that confirmed that the McGuinness roundabout option was fatally flawed.